I caught a disturbing article in The New York Times this week about how food marketers are promoting table sugar as a “natural,” “healthier” ingredient compared to high-fructose corn syrup (HFCS). This comes on the heels of those commercials you’ve probably seen, sponsored by the Corn Refiners Association, claiming that HFCS actually isn’t any worse for you that regular sugar. Who’s a girl with a sweet tooth to believe? Here’s the truth: HFCS isn’t much different metabolically than table sugar. Table sugar (sucrose) is comprised of 50% glucose and 50% fructose. Fructose, as compared to glucose, is digested differently because glucose is absorbed in the upper intestine into the bloodstream, whereas fructose is metabolized in the liver first, and then gets into the bloodstream. While fructose is thought to reduce the blood sugar response after eating it, there is evidence that it may promote fatty liver, which leads to a whole host of metabolic issues. The type of high-fructose corn syrup used in the US food supply is referred HFCS55 (55% fructose; 45% sucrose). Metabolically, the difference of 5% fructose from table sugar to HFCS cannot be the culprit in our nation’s expanding waistline. Recent studies have suggested that HFCS now represents more than 40% of the sweetener market and is the number-one sweetener used in soft drinks. A very conservative estimate is that we consume, on average, 145 pounds of sweeteners per year—or about 130 calories just from HFCS each day! The main issue is that HFCS55 is the primary sugar added to most convenience foods, soda, and candy. So, it’s not surprising when surveillance studies show that Americans with higher HFCS intake are fatter than those with the least. Duh: If you diet is rich in foods rich in HFCS, chances are you’re going to have some pudge. 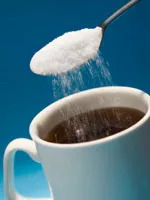 Table sugar, due to being more expensive, has fallen out of favor as an ingredient in processed foods, but since it’s become the new “health” sweetener, you can expect to see more processed foods and niche sodas that are “naturally sweetened with sugar.” How novel. Do I need to tell you where this is going? Probably not. We eat WAY too much of all sweeteners—sugar, honey, HFCS, fructose, dextrose, maltodextrin—and they all provide four calories per gram without positive nutrients to our diet, so all sugars should be limited to no more than 10% of total calories, as the World Health Organization recommends. That’s cutting our daily sweetener intake in half or more: For most women, that’s no more than 200 calories of sweeteners per day! On nutrition labels, that translates to roughly 50 grams of sugar. Generally if a food has 10 or more grams of sugar, it’s too rich for a normal daily diet and you should account for it elsewhere. So read your food labels, and watch out for all types of sugars. Don’t be fooled by sugar-coated industry claims.